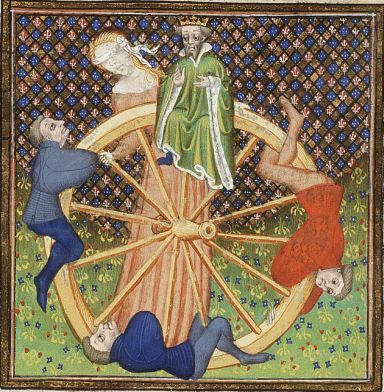 People loved the idea of a ‘wheel of fortune’ back in the Middle Ages – ‘Rota Fortunae’ – I wrote a paper about it once. What comes up, must go down. The fickle finger of fate. Well, we’ve decided to have one more spin of the wheel with my own eggs. Maybe I’m daft – I don’t know. At the moment that’s me in blue, getting squashed by the wheel (see picture above). Our consultant was very keen for us to try again. He said our last cycle was exemplary – 7 eggs, 7 fertilised, 7 blastocysts. If we can replicate similar success again he thinks we have a reasonable (1 in 4’ish) chance of it working. Back in the day I probably would have felt excited. This time I did not – it’s impossible to say the last cycle was ‘exemplary’ when it didn’t work! Anyway, I need to stop thinking like that. If we’re going to do this I need to think positive and upgrade the PMA. We’re going away in June so I’m going to wait until early July to start the next cycle. Same short protocol as last time….and I’m going to start taking DHEA too. I’m not sure it will make any difference in 7 weeks but I guess it’s worth a try. I’m also still on CoQ10 and all the other stuff. And – I’m going to try a high protein, low carb diet. This study suggests it’s well worth a try. Do I need my head testing? Possibly. Am I going to get my hopes up again? Definitely. Is this our very last time trying with our own eggs? HAS to be. We’ve been at the bottom of the wheel for the last 12 months, the only way is up right?